Carlsberg, the official beer of UEFA EURO 2016, is offering fans a chance to watch the semi-final live in France, fans will get to ‘Play on Pitch’ at Stade de Lyon – the official stadium of the UEFA EURO 2016. During the launch of the promotional event, Carlsberg Malaysia transformed the venue into a mini football pitch, complete with a showcase of football juggling by football freestylers to give guests a peek of what the contest winners will enjoy at the UEFA EURO 2016. 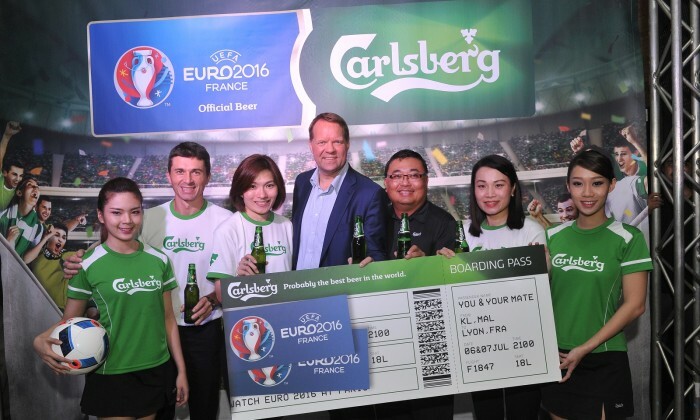 Henrik Juel Andersen, Carlsberg Malaysia managing director, came dressed as a football manager and kicked the event off with a pep-talk style speech at the locker room inspired spot of the venue. “It is probably the best football prize as the winner of UEFA EURO 2016 gets to play, interact and probably score some goals together with some great legends from the past UEFA EURO tournaments on the pitch of Stade de Lyon. The experience will culminate at the Grand Awards dinner where they will get to mingle with the past UEFA EURO legends,” said Andersen. Exclusive to only 100 winners from around the world, fans will get the ultimate VIP treatment of a lifetime watching the UEFA EURO 2016 with the best seats and be treated like football stars. They will be handed personalised soccer kits, gain access to locker rooms and other entertainment, all while enjoying some refreshing ice-cold Carlsberg beside some of the world’s biggest names and legends in football. Carlsberg has collaborated with the global football freestylers to recreate the ten best EURO moments from the past 40 years through a series of videos available for viewing on a microsite, giving fans a sneak peek into the exclusive Play on Pitch experience. This was also to drum up anticipation for the campaign. Interested members of the public will have access to the contest on their mobile WhatsApp and WeChat apps or affiliated bars and restaurants until 7 June. Carlsberg has been the official sponsor of the UEFA EURO for 8 consecutive UEFA tournaments since 1988.